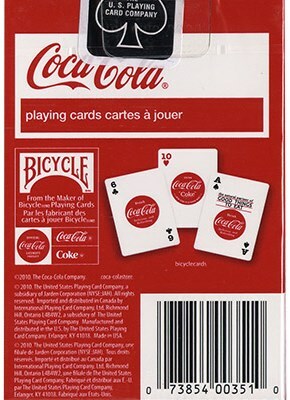 This is an ideal deck for Coca Cola fans, with the distinctive red and white colours, and the official local and brand name. The cards themselves are a smooth finish - still decent quality, but they don't perform quite as good as an embossed deck. The backs are borderless and have a one-way design. 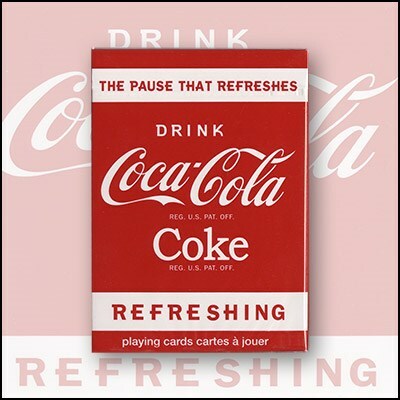 Every card has a "Drink Coca-Cola Delicious and Refreshing" icon in the middle, while the Aces, Jacks, Queens and Kings all have unique artwork for each i.e. four different designs. Pips and indices are customized, so the entire deck looks very different from a normal Bicycle deck. Mainly for the collector.